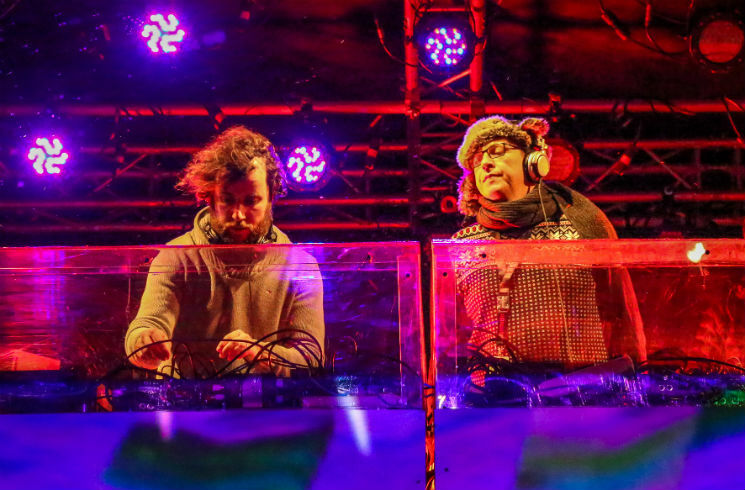 The only artists on Igloofest's secondary stage for the night (January 28), Sonic Crew are a duo known for creating Astropolis, a popular French festival that has been going on for over two decades. In the tradition of European fests and old-school Paris raves, their set featured uptempo, busy grooves and a variety of house inclinations. Evolving within these boisterous styles of dance music, the two DJs started their show with tracks that mixed techno influences and French touch accents, sometimes veering into epic territory. As the evening progressed though, the pair moved towards heavier, sometimes cacophonous beats, ending with a few industrial-sounding tracks. Unfortunately, the public there to dance to Sonic Crew's set didn't rival the tens of thousands of attendees they attract at Astropolis every year. Perhaps because the pair were scheduled a little too early, most of the Igloofest crowd only made it in time to catch the end of their performance.